Secretary of state for health Andrew Lansley is consulting on plans to give GPs control of much of the NHS budget and to abolish primary care trusts (PCTs) and strategic health authorities (SHAs) in favour of a new NHS Commissioning Board. 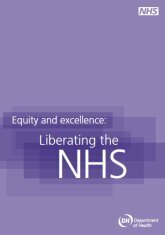 The white paper 'Equity and excellence: Liberating the NHS' outlines the governme nt's plans for reforming the NHS. It proposes shifting control to GPs to commission a wide range of services on behalf of their patients. Local authorities will take reponsibility for public health, including appointing directors of public health. However, GPs commissioning powers will include some public health work. Details on public health issues and a new public health service will be addressed in a further white paper in the autumn. The government will ring-fence the public health budget, which will be 'allocated to reflect relative population health outcomes, with a new health premium to promote action to reduce health inequalities'. The consultation on the plans will lead to a health bill in the autumn, the white paper includes a timetable for the changes with many coming in to force for April 2012. You can read the white paper on the Department of Health's site and related stories on the MHF's site below. Submitted by Visitor on 26 July 2010 - 12:18pm. I manage a small size charity delivering a range of health related interventions in Rural Daventry District, we receive a grant via our NHS trust we have targets to meet and the grant is robustly moniterd. What concerns me greatly is that despite a proven track record of good work, we may still face arbitary cuts accross the board. Too little focus is placed on prevention and many aspects of our work are difficult to quantify. If we have to cut back though the local community will soon notice as used needles begin to litter our local parks, rates of STI's go up and rates of unplanned pregnacy increase. The pressure on GP practice will grow and the pressure and demand on local authority services will also increase as our agency prevents many people needing those services in the first place. GP's I have spoken to about the proposed changes are not keen at all and the cost of such a move in such tough economic times beggers belief. Yes there is waste within the NHS and this should be adressed, but if it aint broke don't fix it and that old saying about people not missing their servcies until they dissapeare and they are left wondering where they are, will echo accross the land!